London - Ireland's Jason Smyth has staked his claim to challenge "Blade Runner" Oscar Pistorius as king of the track at the Paralympics by lowering the new world best in the T13 100m to 10.54secs. The 25-year-old, who like Pistorius competes in non-disabled races, narrowly missed out on a berth in the Ireland Olympic team by four hundredths of a second but showed his outstanding class late Friday by romping home in the heats. Northern Ireland-born Smyth, who is visually impaired, is based in Florida and trains with US sprint star Tyson Gay, who is the second fastest man ever over the 100m behind Jamaica's Usain Bolt. Gay, the former double world champion at 100m and 200m was a member of his country's 4x100m relay team that won silver at the Olympics earlier this month. Smyth said training with the American had helped him improve. "I've been based out there for the last three years so (I'm) pretty much doing exactly what those boys are doing, I'm part of the group," he told reporters. "I've come along a way, I've learned a lot and I've got quicker and quicker, so just to be in that environment with the second quickest man ever is great." Smyth goes in the T13 100m final as clear favourite on Saturday night, shortly before Pistorius begins his quest to defend all three of his Paralympic sprint titles, starting with the T44 200m. 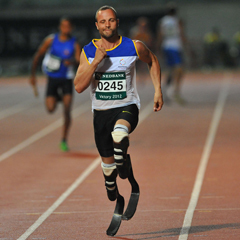 But Pistorius, who has earned his nickname as he runs on carbon fibre prosthetics, is facing a tough challenge in the T44 100m after Britain's Jonnie Peacock lowered the world best to 10.85secs earlier this year. He will also face tough competition from his rival Jerome Singleton of the United States, whom he only just beat in the straight sprint in Beijing. Smyth ruled out a Paralympic athlete running under 10secs for the 100m in the near future. The defending T13 100m and 200m Paralympic champion has run a personal best of 10.22secs but International Paralympic Committee (IPC) rules state that times need to be set in IPC-licensed events, so it did not stand as a record. "At the minute I don't think it (going under 10secs) possible but I would never say never," Smyth said. "I ran 10.22 and my concern now is to get 10.1. And if I get 10.1, I'll worry about getting 10.0. It's one step at a time and to go from 10.2 down to under 10 is a massive jump." Smyth said he hoped that his performances would help raise the profile of Paralympic sport, which currently is focused on the achievements of Pistorius after he became the first double-amputee to compete in the Olympics. But he said it would take more than one man to raise awareness about Paralympic athletes and push up standards. "What he (Pistorius) does is fantastic. We're trying to improve Paralympic sport and bridge the gap between the Olympics and Paralympics but I also think that it's not one athlete that will be doing it alone," he said. "You need a bunch of athletes all coming through to really push it forward. At times it would probably help if things were spread out a bit more. But it is what it is. "To be fair, he is doing a good job of promoting Paralympic sport and there's not much more I can do than get out and perform."